CREATE AND CRAFT - THE GREAT AUGUST GIVEAWAY! Welcome to the latest newsletter from Create and Craft and Silverbean. Create and Craft are excited to announce the Great August Giveaway! Every day there will be a new giveaway onsite, with Create and Craft giving away£2 millionworth of free gifts during the event. Not only do you get free gifts but there's also free postage and packing on all items. There is also 20% off all sewing and quilting items alongside the free P&P offers using the code SEW20. All offers end at Midnight on Monday 29th Augustso hurry and promote on site now while stocks last, there has never been a better time to buy! We hope you are well and looking forward to the weekend. To celebrate the bank holiday we have a handy new member deal worth shouting about! 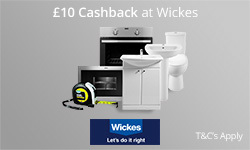 For those planning a home makeover, we're offering £10 Cashback at Wickes on a £10+ spend. As always, it would be awesome if you could promote us. Please see below for more details. New Members spend £10+ at Wickes and get £10 cashback. All new members have to do to claim their £10 Cashback at Wickes is follow these four easy steps! New members click on the banner above and sign up to TopCashback; we will take them to the offer page. New members click 'Get Cashback Now' to go through to Wickes website and shop as they normally would. New members can enjoy their weekend DIY knowing they'll be recieving £10 Cashback. We are excited to announce Tesco Direct's Bank Holiday Event, which includes a number of special offers on select Direct products. This special bank holiday offer allows customers to choose from a selection of BBQ meats, where they can enjoy 3 for £10 along with a 1L bottled spirit for £15. AFFMAY8 - Save 8% off Compatible Cartridges. 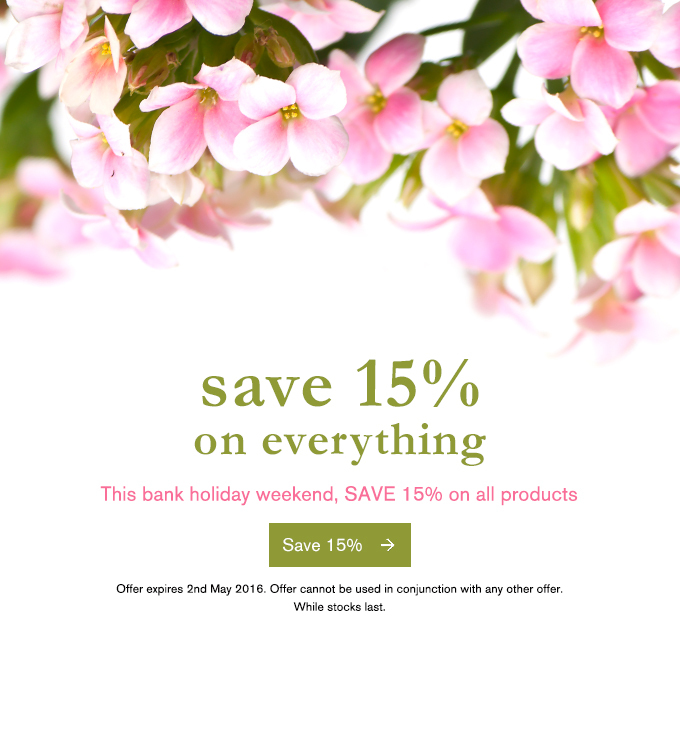 AFSTMAY - Save 10% off Stationery. PICTURE15 - Save 15% off Picture Expert Photo Paper. TONER15 - Save 15% off Compatible Toner. 5INK - Save 5% off Original Cartridges. Clas Ohlson - Bank Holiday sale ends today! The Bank Holiday sale isn’t over. Last chance to buy today! - This great value Kettle BBQ was £19.99, now it’s just £12.99. - Save £20 when you buy the Bluetooth Tower Speaker for £29.99. - Get up and go with our eco-friendly Electric Bike. Save £100 and buy for just £599.99. 3 for 2 on BBQ and Picnic Essentials! - Planning a picnic? Keep everything fresh in our Cool Bags. Coming in all different shapes and sizes, prices start from £2.99. - Don’t forget the Charcoal! Buy 3 for the price of 2. Prices starting from £2.99. - Keep the lawn fresh with the Bosch Electric Lawnmower now £159.99. - Enjoy 3 for 2 on all Peat-Free Planting Coir, just £2.99. 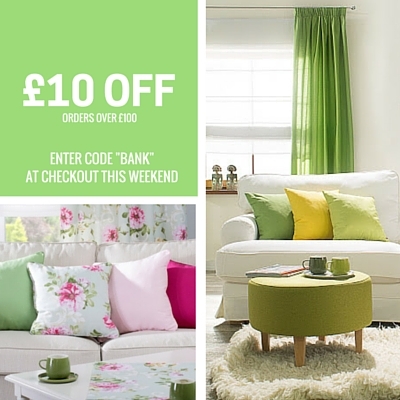 Save £10 on all orders over £100 this Bank Holiday Weekend. This offer is valid on all products on www.dekoria.co.uk until midnight 2nd May 2016. Just Sheepskin Bank Holiday Promotion 10% off everything! JUST SHEEPSKIN - BANK HOLIDAY PROMOTION 10% OFF EVERYTHING! Just Sheepskin are pleased to announce they are offering 10% off everything for 4 days only - don't miss out! To qualify simply enter the code HOLIDAY at the checkout. Valid from Friday 29th April until midnight Monday 2nd May 2016. From queen slippers to angel booties you'll be mad not to treat yourself to a little something! Remember there is also Free Standard UK delivery on ALL orders. Please promote on-site and to your audience. Rowlands Pharmacy - Bank Holiday Promotion 10% off all weekend! ROWLANDS PHARMACY - BANK HOLIDAY WEEKEND 10% OFF ALL ORDERS! Rowlands Pharmacy are pleased to announce that they are offering a massive 10% off all orders! To qualify for this discount enter the code MAYDAY16 at the checkout. This promotion is available from Friday 29th April until midnight Monday 2nd May. This includes popular ranges including premium fragrances, Yankee Candles and cosmetic products including Mac make-up and Chanel body lotions. Don't forget Rowlands Pharmacy also offer free UK standard delivery on all orders over £30.00. This is automatically added at the checkout. Please promote onsite and see below for some of our favourite buys during this promotion. Our Yankee Candles range is full of fantastic smells to suit everyone. The medium are the best of both worlds, small enough to blend in with any room, and yet long-lasting with a burning time of around 65-90 hours. Simply dim the lights and use Yankee jar candles around the room to instantly add cosiness to your night in. They are available for only £17.10 during the bank holiday promotional weekend when using the code MAYDAY16 at the checkout. Offer available until midnight Monday 2nd May. Mac is modern foundation that combines a natural matte finish and medium-buildable coverage with broad spectrum available in a range of colours to match all skintones. Available now for only £19.80 when purchased over the Bank Holiday weekend and using the code MAYDAY16 at the checkout. Offer available until midnight Monday 2nd May. Thierry Mugler Alien offers a luxurious yet classic smell and included in the giftset is 30ml eau de parfum, 100 ml body lotion and 30ml shower gel. Available for only £34.19 including free delivery when purchased over the bank holiday weekend. Enter the code MAYDAY16 at the checkout to qualify for discount.Offer available until midnight Monday 2nd May. 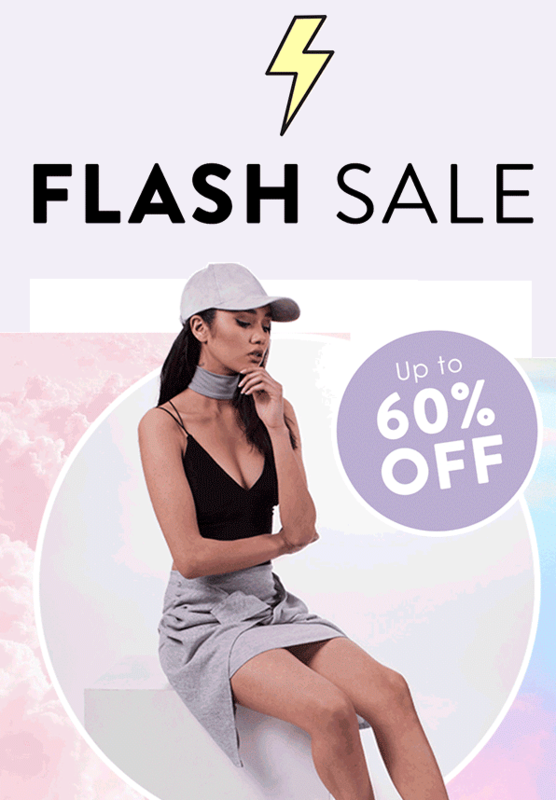 WHEELIES - Further 10% off items in the Spring Clearance! Welcome to the latest newsletter from Wheelies and Silverbean. Wheelies is offering a futher 10% off items in their Spring Clearance this Sunday! In Association with Wheelies Exclusive Affiliate Partners Agency. Get more for less this Bank Holiday weekend. Sale ends Tuesday! - Save 40% when you buy the Bluetooth Tower Speaker for £29.99. - Save £60 when you buy this great value Café Set now just £69.99. - Essential for any BBQ: This Grill Brush is essential an easy clean, mix and match with other BBQ essentials. Up to 50% off spring clearance! - Find a home for all your tools with the great value Crocraft Tool Chest now £109.99. - Now the matching Cocraft Tool Cabinet is just £159.99! - Solve your DIY problems with the Cordless Cocraft Drill/Driver now £54.99. - Avoid the tangled cables with our Wireless Stereo Headphones now £29.99. - Don’t forget the Charcoal! Buy 3 for 2 on Charcoal from £2.99. - Keep the drinks refreshed in our great value Cool Bag, with prices starting from £2.99. Great ideas for your garden! - Enjoy some al fresco dining with our two chair café set only £119.99. - Organise your plants with our spacious Mini Greenhouse now only £14.99. 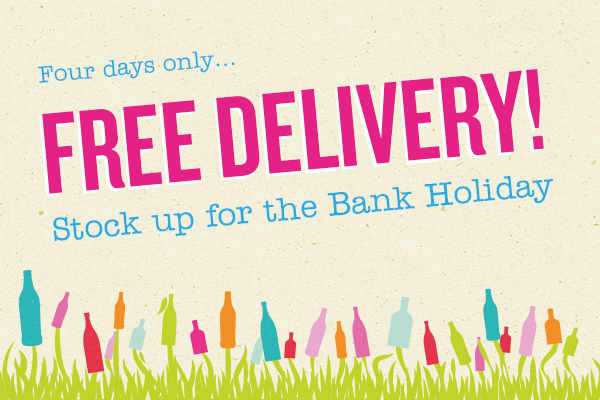 Free Delivery for the Spring Bank Holiday! Stock up for the Spring Bank Holiday with free UK Standard delivery on all online orders until noon on Tues 26th April! Free delivery is a very popular time for our website so please raise awareness to drive your commissions! We offer a wide range of smart, practical and affordable products across five categories; Hardware, Electrical, Multimedia, Home and Leisure. Shop up to 50% off selected items this Easter Bank Holiday weekend at Clas Ohlson. From garden furniture to power tools, we have everything you need to get ready for spring. - Outdoor Café Furniture set was £119.99 now only £79.99. - Keep your garden party safe from rain with our 3x3m Gazebo now only £49.99. - Organise your tools with the great value Crocraft Tool Chest now £109.99 and the matching Tool Cabinet now £159.99! The offers don’t stop there! We’re also offering more great value power for less with 20% off LXC Power and 20% Off Stanley. Offers end Monday 28th March. - Our LXC battery powered products start from only £10.39. - Our Stanley range begins at £3.39 and has everything you need from Screwdrivers to Tool Boxes. - Get all the benefits of juicing with the Coline Slow Juicer – Was £119.99. Now only £59.99. - Take a look at our great value Bank Holiday offers starting on Wednesday, with over 50% off selected items. Get ready for those garden parties with 20% off all Solar Lighting! - Enjoy those spring evenings with our Bright Solar Garden Lights that turn on automatically at dusk - only £5.59. We have a collection of great products ideal for your spring clean this month. Spring-cleaning has never been easier. - Get your home in order with our smart storage solutions from £1.99. - Vacuum Cleaner now only £29.99. Mix & Match 3 for 2 on Bike Accessories! - We’ve everything from Gel Saddle Covers from £8.99 to LED Front Bicycle Lights from £24.99. 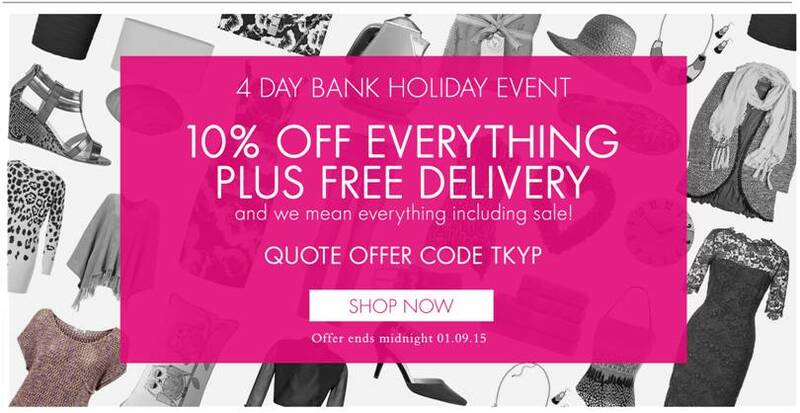 Here at Kaleidoscope, when we say we’re offering 10% off everything, we mean everything. You can enjoy everything at Kaleidoscope for 10% less this bank holiday weekend when you use the code TKYP at the checkout. This includes all ranges, including sale. Grab yourself a bank holiday weekend bargain now! This offer runs until Tuesday 1st Sept.
Not yet a part of the Kaleidoscope affiliate program? You’re missing out up to 10% commission! Be sure to check out our profile on Affiliate Window.